Type your SF Express tracking number below, get live delivery information with our express tracking system. Ever since its establishment in Shunde Port in 1993, SF Express has been committed to improving service quality and satisfying market demands. It has set up powerful business services including information collection, market development, logistics distribution and express delivery services. In addition, it has set up nationwide service network and is now actively expanding its overseas business. SF Express has launched services in mainland China, Hong Kong, Macau, Taiwan, the U.S., Singapore, South Korea, Malaysia, Japan, Thailand, Vietnam and lately Australia. If you have problem with our express tracking system, please track your package directly on the SF Express website. If you get no tracking information from SF Express official website, you’d better contact them. 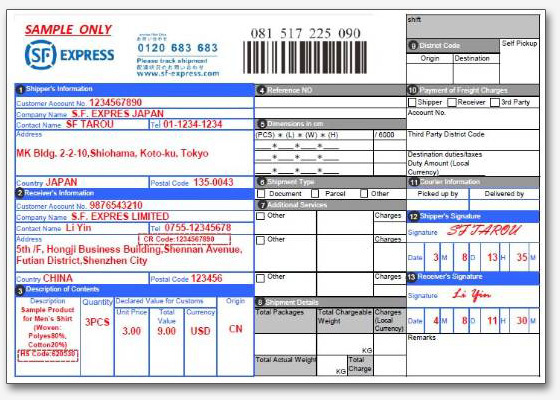 If you have shipped through SF Express, you will have received a copy of your Waybill. Each waybill has a distinct number which can vary between 10 to 12 digits(eg: 850360452, 781209907442). Here is a waybill sample which shows the SF Express tracking number is 081517225090. Have no idea about SF Express? Read SF Express reviews in advance and write a review after sending your package with SF Express. If you have problem with our SF Express Tracking system, submit your problem here, we will help you as soon as possible. Declare: We can NOT contact carrier or others on your behalf, we can only help you track your package with your SF Express tracking number on official tracking system. I cannot track my tracking number of s.f express. it’s doesn’t work several times. i don’t know why? We need your SF Express tracking number before we can help you. We are not associated with SF express. We suggest you contact SF Express customer service for more help. I need the return label please let me know where to send the goods back? We suggest you contact SF Express customer service for more help. Do you have a contact e-mail for your SF-Express in China, Shanghai who speaks English. If the tracking number is not on our system, we suggest you track your sf express on official website directly. If you have problem about your package, we suggest you contact the SF Express official customer service for more help. Please update the status of Local delivery in Hong Kong for following AWB Nos. Your SFExpress is Estimated to arrive before:2018.08.20 18:00. We provide SF Express Tracking service only, if you have any problem about your package, please contact the official customer service for more help. Your package has been Delivered on Nov, 24 2018. Thank you for using SF Express. Looking forward to serving you again. If you have any problem about your package, please contact the official customer service for more help. We provide a third part SF Express tracking service, if you have any problem about your package, we suggest you contact the official customer service for more help.